In the earlier post we saw how to install Virtual Windows XP or enable Windows XP mode in Windows 7, in this post let us discus the various features of Virtual Windows XP. The Virtual Windows XP that is installed is Windows XP with service pack 3 (SP3) so all your old legacy applications that depend on Windows XP can be used under Windows 7 environment. 1. 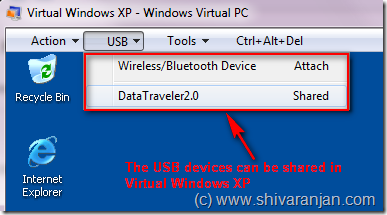 Support for USB devices: All the USB devices that can be used in Windows 7 can be accessed from Virtual Windows XP mode, this includes printers and scanners, flash memory/sticks and external hard disks, digital cameras, and more. 2. Clipboard sharing: Cut and paste between your Windows 7 host and any virtual machine. If you are working in an application in Virtual Windows XP, the data from Windows 7 clipboard can be used in guest operating system and vice versa. 3. Folder integration between host and guest: Access your Windows 7 Known Folders: My Documents, Pictures, Desktop, Music, and Video, from inside the virtual Windows environment, such as Windows XP Mode. 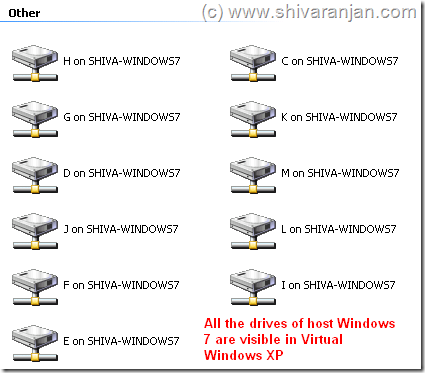 All the drives of Windows 7 are visible and accessible Virtual Windows XP mode. 4. Seamless integration of applications: Publish and launch applications installed on virtual Windows XP directly from the Windows 7 desktop, as if they were installed on the Windows 7 host itself. 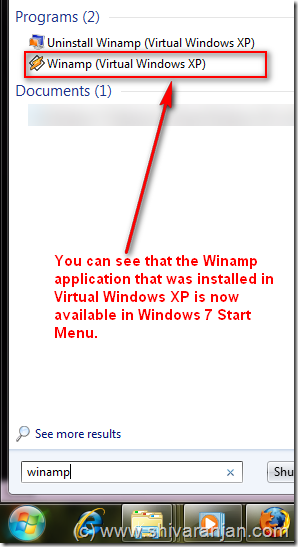 In the below screenshot we can see that we have installed application Winamp in Virtual Windows XP but we can see that it is available in Windows 7 start menu. 5. Printer redirection: Print directly to your attached printer in Windows 7 from your seamless application or virtual Windows XP mode. 6. Ability to Work Virtual Windows XP mode in Full screen: If you enable full screen mode then you will feel as if you are working in Windows XP and this particularly useful when we are working on an application that requires lot of screen real estate. The above were some of the main features of the Virtual Windows XP mode.